This repository contains a selection of the data — and the data-processing scripts — behind the articles, graphics and interactives at FiveThirtyEight. We hope you’ll use it to check our work and to create stories and visualizations of your own. The data is available under the Creative Commons Attribution 4.0 International License and the code is available under the MIT License. If you do find it useful, please let us know. Update: This post has hit Hacker News – you might want to follow the comments over there. I have been playing around with the very nice Visual Studio Code editor recently. For those who don’t know, it’s a free source code editor from Microsoft which works cross-platform. The reason I was giving it a look is that it has pretty good support for editing Go, a language I am trying to find the time to learn. I was also keen to see what the New Microsoft could offer a non-microsofty like myself. Notice: This extension uses the teacher node module which calls the After The Deadline service to check for spelling and grammatical errors. Document text is sent to the service over unencrypted HTTP. Do not use this extension with sensitive or private documents. My first reaction was “Surely I’ve misunderstood something, right?”. So I enabled the extension and opened up a non-sensitive file, one of my in-progress blog posts. I then downloaded wireshark to take a look. It took a while to sift it out – it’s been a LONG time since I used wireshark (so long ago that back then it had still been called Ethereal), and there is a rather large amount of traffic generated from my machine for things like Sonos and Dropbox and the like, but eventually I tracked down what was being sent. Sure enough I could see all the text being sent, unencrypted, over HTTP to the ‘After The Deadline’ service. So, at least the documentation was accurate, and that this absolutely insane thing was happening. As per the documentation, the extension is just making use of a node plugin called teacher, which is just a thin node API (last updated over 4 years ago) to help call a service called After The Deadline. This piqued my interest – who were the people behind this service? Could they be trusted? Their website immediately made me think of some of the pretty bad stock product website from 2008, but I was surprised to see that the company behind the service is Automattic, the company behind WordPress, amongst other things. This started to make a bit more sense. In the context of a blog post, which is something designed to be shared publicly, the fact that this information is being sent to another party isn’t too much of a problem. But in the context of the sorts of things we open up in a source code editor, this is utterly insane. Partly, the problem here is that this traffic is being sent unencrypted. We’ll get to that in a moment. But even if this service did use HTTPS (and I can see no good reason why it can’t), by using this plugin I am explicitly trusting that not only with the service I send my data to not do anything silly with the information they receive, but that they will ensure it is properly managed and not left lying around to be swept up by some malicious attacker. And again, the amount of sensitive information this could include could be staggering. Source code can be bad enough, but think of the number of times you’ve put sensitive things like AWS keys or passwords into text files. Now think what happens if they fall into the wrong hands. The HTTP-only support is also nuts. This means that even if I do trust Automattic to look after my potentially private and sensitive information, I’m opening myself up to people pretending to be After The Deadline. Given the use of a very old node plugin in this tool chain, I did wonder if perhaps After The Deadline did support HTTPS, but that the extension’s reliance on the teacher plugin may have limited the ability to use a slightly more sensible protocol. Poking around, it becomes pretty clear that After The Deadline is a freely available service, which Automattic have decided to run for you. You are free to run your own copy of the stack if you want, which you could then decide to protect with HTTPS. From the docs it wasn’t clear if Automattic support HTTPS on the version they host, but I couldn’t find anything in the FAQ or documentation to imply that they did. Update: Thanks to a comment over on Hacker News from zerocrates, it seems that After The Deadline does in fact support HTTPS in addition to HTTP (although I think my point about this not being clear in the docs still stands). Another commenter points out a recently opened issue against the teacher module is asking for HTTPS support. Just so we’re clear, a sensible solution, for a spell checker that needs to run over sensitive information, is that it should run locally (ideally using a system & user dictionary), without any remote calls needed. It seems odd that I have to spell that out (pardon the pun) but the fact that this extension exists at all seems to be a good enough reason to have to call this out. And it turns out that popularity doesn’t always steer us in the right direction – the second spell checking extension that shows up and has a fraction of the installs (88 vs 20K), is a good old fashioned checker that uses a local dictionary. Go use that one instead. Automattic should give serious thought to supporting their freely available service over HTTPS too. Even though I can’t see any situation where I’d want to use this service in this specific context, for the WordPress ecosystem having this service served over a sensible, and in this day and age easy to implement protocol, would be a very good idea. Update: As pointed out above, it seems that After The Deadline can support HTTPS. I’m sure that Sean McBreen, who wrote this plugin, has no malicious intent. He spent his own time creating this extension, and gave back to the community. He did a great job implementing and documenting an extension that I think is unfortunately misguided in this particular context. I’m going to try and track down Sean to see if he has any views on this (the marketplace for extensions doesn’t seem to give you an obvious way to find or contact authors, which seems an oversight). To be fair to him, he’s been extremely clear in the documentation as to what happens under the hood, but I’m still surprised that the use of an external (and un-trustable) service in the context of code is sensible. I’m just as surprised by the number of 5 star reviewers (and the 20K+ installs) listed on the marketplace – perhaps the reviewers have a different view of security to me. For the last three and a half years, every single command I’ve run from the command line on my MacBook Pro has been logged to a set of log files. Uncompressed, these files take up 16 MB of disk space on my laptop. But the return I’ve gotten on that small investment is immense. Being able to go back and find any command you’ve run in the past is so valuable, and it’s so easy to configure, you should definitely set it up today. I’m going to share how to do this so you can take advantage of it as well. You’ll need to configure an environment variable so that it’s loaded in every command line session. On my MacBook Pro, I use the .bash_profile file. On other operating systems, the .bashrc file is an option. See this blog post on .bash_profile vs .bashrc for more on the differences. First, this checks to make sure we’re not root. If that checks out, it appends a line that includes the current timestamp, the current working directory, and the last command executed to a log file that includes the current date in the filename. Having the commands stored in separate files like this really helps when you’re trying to find a command you ran sometime last month, for example. It will only take a few seconds to update your PROMPT_COMMAND so that it logs every command to a file. And the next time you’re trying to remember the command line options you used with find that one time (but can’t find in your current session’s history), you’ll be able to look it up in the log files. Oh, and if you want to know how many times you’ve done a git push in the last three and a half years, you can look that up, too (5,585 git pushes for me)! Running the code is as easy as install Docker, make dev, and run a script. Contributions are welcome. Open an issue if you want to discuss something to do, or email me. predict if the center 9px of a 64px tile contains road. use the infrared (IR) band and RGB bands. be 75-80% accurate overall, training only for a minute or so. use a single fully-connected relu layer in TensorFlow. render, as JPEGs, “false positive” predictions in the OSM data – i.e. where OSM lists a road, but DeepOSM thinks there isn’t one. For training data, DeepOSM cuts tiles out of NAIP images, which provide 1-meter-per-pixel resolution, with RGB+infrared data bands. For training labels, DeepOSM uses PBF extracts of OSM data, which contain features/ways in binary format that can be munged with Python. The NAIPs come from a requester pays bucket on S3 set up by Mapbox, and the OSM extracts come from geofabrik. DeepOSM has been run successfully on both Mac (10.x) and Linux (14.04 and 16.04). You need at least 4GB of memory. You need AWS credentials to download NAIPs from an S3 requester-pays bucket. This only costs a few cents for a bunch of images, but you need a credit card on file. First, install a Docker Binary. Inside Docker, the following Python scripts will work. This will download all source data, tile it into training/test data and labels, train the neural net, and generate image and text output. The default data is six NAIPs, which get tiled into 64x64x4 bands of data (RGB-IR bands). The training labels derive from PBF files that overlap the NAIPs. For output, DeepOSM will produce some console logs, and then JPEGs of the ways, labels, and predictions overlaid on the tiff. Also see a work journal here. I am reviewing these papers from Google Scholar that both cite the key papers and seem relevant to the topic. Parasite Eve with the experimental GL renderer. Note the screen residue glitches at the bottom. Here is the first release of Mednafen/Beetle PSX HW. You can download this core right now for Windows, Linux, and OSX. NOTE: THIS IS AN ALPHA VERSION AND IT IS NOT REPRESENTATIVE OF THE UPCOMING BETA VERSION. PERFORMANCE RIGHT NOW IS A LOT LOWER THAN WHAT IT WILL BE FOR THE BETA VERSION. EXPECT BUGS TOO. See a complete screenshot gallery here. Go to RetroArch, go to Online Updater, go to ‘Update Cores’, and download ‘PlayStation (Mednafen PSX HW)’. You might need to update your core info files first before this will show up properly. To do this, go to ‘Online Updater’, and select Update Core Info Files’. You need to have a GPU that supports at least OpenGL 3.3 core context in order to use this. It might be possible to lower GPU requirements in time but now is not yet that time. Gran Turismo 1 with the experimental GL renderer. We have added an OpenGL renderer to Mednafen PSX. This renderer is based on simias’ GPU renderer for his Rust-based PlayStation emulator, Rustation. Lots of people worked hard on bringing this to you. It was a joint team effort between r5z, simias, zeromus, and me to bring this from Rust over to C++, and in a way so that it still benefits Rustation as well. This is probably the first OpenGL renderer for PSX that is not based on outdated fixed-function OpenGL code and which is, actually, well, open-source. Because we can assume shaders will be there, we can get reasonably close to emulating texture windows accurately (with Pete’s OGL1 GPU plugin, there were codepaths for doing it with paletted textures – the hacky approach – and the pixel shader approach). Therefore, the renderer is still kept pretty simple and easy to understand. Resident Evil 2 with the experimental GL renderer. VRAM-to-VRAM copies right now are completely broken. You might see several glitches during FMVs and/or other scenes that require framebuffer manipulation. Final Fantasy 7/8’s pre-battle swirls come to mind as examples of that. There are still several texture updating problems. The water in Tomb Raider 2 for instance can initially appear flat shaded until you take a savestate. Other problems include Resident Evil 3’s sprite-based inventory system, when you add or remove items from this list, the changes might not be reflected on-screen. There are still some graphics issues. One example is the broken opacity boxes around Silent Hill’s objects. There are still several crippling performance bottlenecks with this GL renderer. The first priority is getting the rendering to be as accurate as the software renderer until optimization becomes a priority. Toggling fullscreen will give you a black screen. This is yet to be implemented. There are currently some near/far issues right now where objects very close to the projection camera can appear glitched onscreen. There might still be some resolution issues where some portions of the screen don’t get clipped away as they should, so you might see some onscreen garbage in places that are normally obscured and not visible. Internal GPU Resolution (Restart) – This lets you change the internal resolution. NOTE: In this alpha version, it will crash if you try to change this at runtime. Here is a way to work around it: go to Quick Menu -> Options, change ‘Renderer’ to ‘software’, restart the core. Change the Internal GPU Resolution. Then change ‘Renderer’ back to ‘opengl’, and restart. Your changes should take effect now. Right now the max resolution you can set it to is 8x. Texture filtering – This only works with the OpenGL renderer. You can toggle between ‘nearest’ point filtering, 3-point filtering (N64-style quasi-linear filtering), and plain bilinear filtering. Both 3-point filtering and bilinear filtering can impact performance negatively right now, and on average bilinear filtering has less graphics issues than 3-point so far. If you want the best performance, go with ‘nearest’. Internal color depth – This only works with the OpenGL renderer. You can toggle between 32bpp (32bit color) and 16bpp dithered mode. Wireframe mode – It will toggle between wireframe mode and filled shading mode (the default). Display full VRAM – This requires a restart in order to take effect. This allows you to see all the VRAM banks on-screen. Mainly useful for developers only. Street Fighter Ex Plus Alpha with the experimental GL renderer and bilinear filtering enabled. Cg shaders won’t work with this core as long as it requires OpenGL 3.3 core context. Cg is no longer alive from a public consumption perspective and as such they never saw fit to adding support for GL 3.3 core context. So make sure to disable any Cg shaders you had running before trying to run this core. When/if we lower GL requirements, this might no longer become an issue, but you will always have a better experience with this plugin using GL 3.3 or later. You can post bugs and graphics issues here (preferably with screenshots). PBP support is now much more mature. There is support for encrypted official PS3/PSP PSOne games added now thanks to Zapeth. He also submitted some accuracy improvements which should give the emulator a better score with the PSX benchmark test programs. In other news, expect a new point release of RetroArch soon. No Apple TV and Windows UWP support yet, but Blackberry 10 might be coming back for the 1.3.5 point release. a few spaces and they always go fast, so apply today. boon for us, so I wrote Hg Init, a Mercurial tutorial—check it out! 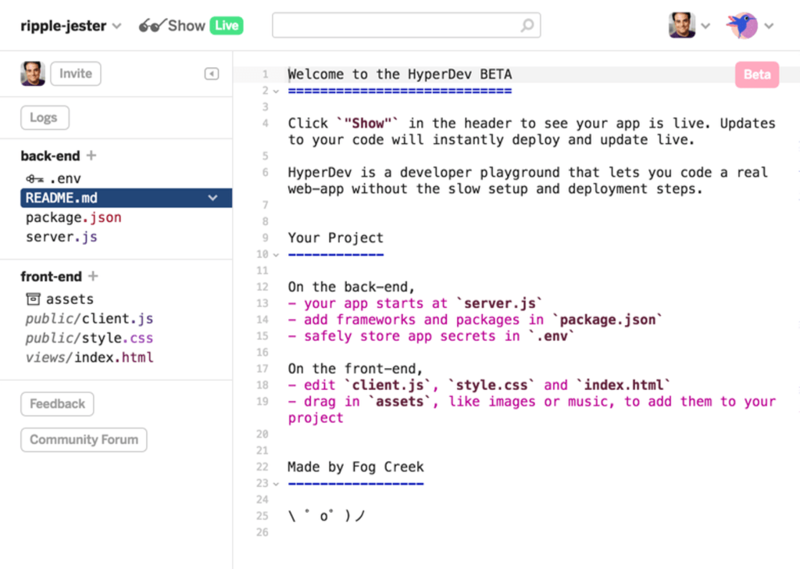 HyperDev is the developer playground for building full-stack web apps, fast. Fog Creek Software, and CEO of Stack Overflow.